My apologies, I know the photo is not the best because I took it with my cell phone camera. I changed the cable a little bit because I wasn’t liking the look of the original design. 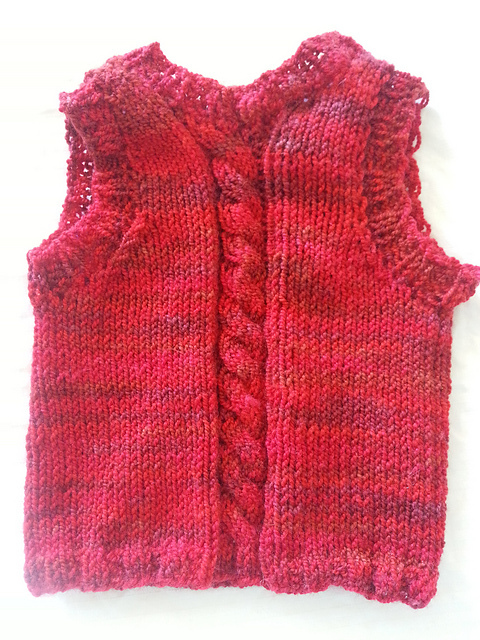 The edging of the sleeves are a little uneven, but I think it will help having one slightly wider to put it on a squirmy baby. The pattern does say its supposed to fit a 6 month old, but it looks so small! The yarn is stretchy but it fits my hot water bottle that I am currently using to soothe my constant lower back pain. I’m not so sure I can wait until April or May to dress him in it, we shall see when he’ll be able to sport it. If it is too small, I figured I can just put it on a teddy bear and decorate the nursery with it. The contents of this pack (needle or any other item) have to be used carefully for needlework only. These should be used with all due care as these may cause injury if used improperly by an untrained/unfamiliar person. Always restrain children’s access to these tools and store these securely. Seriously!? Well, I suppose if their claim to fame is being durable enough to manufacture a space ship they are certainly strong enough to cause harm. Overall, I’m very happy I got them and I am sure I will get many more use out of them. Well I’ve moved again and after two weeks in my new home things are slowly starting to get back to normal. My craft stuff is still all packed up and I still haven’t decided where to keep it all. My husband promised me the hall closet to hold it all, yet somehow his cello and golf clubs ended up taking up most of the prime real estate in there. Not to say that will be where they will remain, but I do wish I could keep it all in one place. Looks like my books and magazine will go in a bookshelf in the living room; my swift, winder and blocking mats are in our bedroom; and the actual stash will potentially go in the closet. I guess it doesn’t really, truly matter, in the end my WIPs end up all over the house, so why not my supplies? I’m a little bored of working on my top down sweater with the all stockinette body, but I’m slowly digging out the things I need. The first thing I looked for was another skein to join to the sweater. I may be tired of working on it, but I purposefully kept this project out of the move so that I would work on it, otherwise I know it has the potential of going into the black hole of UFOs. I am trying to cast on a few baby items, with a little over two months left on this pregnancy, I figured it was time for me to embrace my “nesting” phase. Moving to a new place means being the new girl at the local knitting circles. This is the fourth city I’ve lived in since becoming a knitter and I now know what I need in my knit nights. While in Philly it wasn’t until my third knitting group that I really felt comfortable being myself. It was great environment at a LYS with young professionals and experienced knitters, all who provided great conversation and inspired me to try new techniques. In California I lucked out and on my first try I found a great group at a local Panera. I got tired of the food options very quickly, but the company of the ladies at this circle was always a lot of fun. In Virginia, I gave the knitting circles at the two local yarn shops a try and in the end the owner of one turned me off from her shop, I just knew our personalities would eventually clash so I chose to stay away. Which was for the best anyways, the ladies in the other knit night were a wise bunch and I enjoyed their company. Here in Connecticut there are a few yarn stores all about 20 minutes from where I currently reside. Last week I went to a knitting group that met at 2pm on a weekday. Honestly, I didn’t have the highest of expectations b/c I knew that there wouldn’t be much in terms of variety of knitters who could attend that time slot. And I was right in my assumption, there were two retired women that were there and they were nice enough, but I felt like the third wheel. When they went to get snacks I asked the sales associate if there were more people that would show up, but she confirmed my guess that it was usually just the two of them that bothered to attend and it didn’t seem like the store did much to bring more knitters to its circle. So this week I tried another LYS and was immediately welcomed by one of the owners of the shop. There were about four women sitting around the table and a little sixth grader that was learning her knit stitch (she and her mom left soon after). From then on the group grew more and more boisterous, the store almost ran out of chairs to seat everyone. I felt right at ease making jokes, sharing knitting tips, and admiring the WIPs of what everyone was working on. The environment was lively and the women sassy, it was great! Exactly what I look for in a knit night. 🙂 The first thing I said to my husband when I got home was “I have found my new knitting group!” Not only that, the next time I opened my Ravelry account I got a message from the shop owner welcoming me to the group and hoping to see me back at the shop anytime. I had mentioned that I was on Ravelry, but never gave her my user name, she just took the time to find me and welcome me even more, that was a new experience for me and I absolutely loved it! If you’re looking for a new knitting group take your time and look for the best match for you. I recommend you start by doing a group search on Ravelry, not all knit groups take place at a yarn shop. Give each group you find a few tries before settling in or giving up on it completely. Also, don’t be shy! Introduce yourself and join in on the conversation whenever you can. If after a while you don’t feel included don’t be afraid to start your own knit night at a time and place that is convenient from you. Even if you’re the only person that shows up regularly for a while eventually people will be interested in joining you. That often happened with the California group that met at Panera, someone that was there to eat would be a knitter and the next week they would join the group. Just remember you must then be the one that welcomes them and make them feel included, you might even have to teach them a thing or two before your group grows with regular attendees. In the end finding the right knit group is essential for every knitter out there, it promotes your own creativity, inspires you to try new things and creates lasting friendships.